Amer Fort is one of the most beautiful places in Amer, Jaipur. It is a located on the top of a hill and is among popular destinations for tourists as well as its native neighbors too. This beautiful fort is constructed using Red sandstones and marbles. This Amber fort or Amer Fort consists of the Diwan-i-Aam, or “Hall of Public Audience”, the Diwan-i-Khas, or “Hall of Private Audience”, the Sheesh Mahal (mirror palace), or Jai Mandir, and the Sukh Niwas. At all these places, a cool climate is artificially created with the help of winds that blow over a water cascade, within the palace. 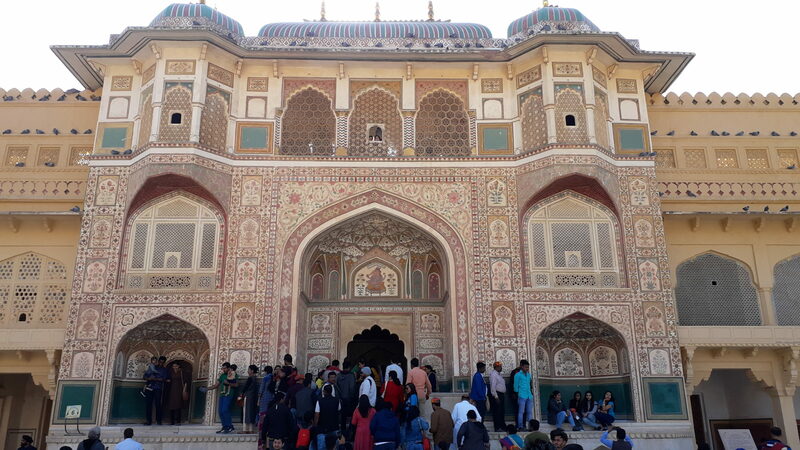 Read about the History of Amer fort to Amer Fort Timing and from things to do in Amer to nearby places of Amer. Also read about Amer fort Facts too. The name Amer or Amber is derived from the name ‘Ambikeshwar Temple’. Some people also believes that this name is derived from goddess ‘Amba’, the other name of goddess ‘Durga’. This Amer fort was once residence of Rajput Maharajas and their families. At the entrance of this Amer Fort, there is a temple dedicated to Shila Devi (a goddess of the Chaitanya cult) near the fort’s Ganesh Gate. It was given to Raja Man Singh when he defeated the Raja of Jessore, Bengal in 1604. (Jessore is now in Bangladesh). The large pathways and gates adds beauty to this beautiful palace. In 2013, Amer Fort, along with five other forts of Rajasthan, was declared a UNESCO World Heritage Site as part of the group Hill Forts of Rajasthan. The first Rajput structure of this fort was started by Raja Kakil Dev when Amer became his capital in 1036 on the site of present day Jaigarh Fort of Rajasthan. Most of Amer’s current buildings were started or expanded during the reign of Raja Man Singh I in the 1600s. Among the chief building is the Diwan-i-Khas in Amer Palace of Rajasthan and the elaborately painted Ganesh Poll which was built by the Mirza Raja Jai Singh I. The current Amer Palace, was created in the late 16th century, as a larger palace to the already existing home of the rulers. The older palace, which is known as Kadimi Mahal (Persian for ancient) is known to be the oldest surviving palace in India. This ancient palace is located in the valley behind the Amer Palace. This palace is divided into four courtyards. Main entry is through the Suraj Pol (Sun Gate) which leads to thingy magiy i.e. the first main courtyard. This was the place where armies would hold victory parades with their war bounty on their return from battles. It was watched by the Royal family’s women folk through the grid windows. This gate was built exclusively and was secured with guards as it was the main entry into the palace. It faced east towards the rising sun, hence the name “Sun Gate”. There is an impressive stairway from Jalebi Chowk (meaning a place for soldiers) which leads into the main palace grounds. However, Sila Devi temple is situated at the right side of stairways of the main entrance. Ganesh Pol (Ganesh Gate) is the entry gate of the private palaces of the Maharajas or kings. It is named after the Hindu god Lord Ganesh (who removes all obstacles in life). The first courtyard is a three-level structure with many frescoes build on it. It was built at the orders of the Mirza Raja Jai Singh (1621–1627). Above this gate is the Suhag Mandir where ladies of the royal family used to watch functions held in the Diwan-i-Aam through decorated marble windows in a grid shape called “jâlîs”. On the right side of the Jalebi Chowk there is a small but a graceful temple called the Sila Devi temple (Sila Devi was an incarnation of Kali or Durga). The entrance to the temple is through a double door decorated with silver. The main deity inside this holy place is guarded by two lions made of silver. However, the story behind the installation of this deity is that Maharaja Man Singh sought blessings from Kali for victory in the battle against the Raja of Jessore in Bengal. The goddess instructed the Raja, in a dream, to retrieve her image from the sea bed, to install and worship it. So, the Raja, after he won the battle of Bengal in 1604, retrieved the idol from the sea and installed it in the temple naming it Sila Devi as it was carved out of one single stone slab. At the main entrance of this temple, there is also a carving of Lord Ganesha, which is made out of a single piece of coral. On the other hand there is another faith of Sila devi temple installation. It is that Raja Man Singh, after defeating the Raja of Jessore, received a gift of a black stone slab. It was said to have a link to the Mahabharata epic story in which Kansa had killed older siblings of Lord Krishna on this stone. In exchange for this precious gift, Man Singh returned the kingdom to the Raja of Bengal which was won by Man Singh. Then, this stone was used to carve the image of Durga Mahishasuramardini, who had slain the demon king Mahishasura, and installed it in the fort’s temple as Sila Devi. From then onwards, the Sila Devi was worshiped as the lineage deity. However, the family deity of Rajput’s continued to be Jamva Mata of Ramgarh. However, the religious rites of animal sacrifice during the festival days of Navrathri (a nine-day festival celebrated twice a year) was also practiced here. The practice was to sacrifice a buffalo or goats on the eighth day of the festival in front of the temple and royal family as well as devotes too. But from 1975, this practice was banned under law, after which the sacrifice was held within the palace grounds in Jaipur, strictly as a private event with only the close members of the royal family watching the event. However, now the practice of animal sacrifice has been totally banned at the temple premises and offerings made to the goddess are only of the vegetarian type. The second courtyard is up on main stairway of the first level courtyard. It houses the Diwan-i-Aam or the Public Audience Hall. This hall is built with a double row of columns, the Diwan-i-Aam is a raised platform with 27 colonnades, each of which is mounted with an elephant-shaped capital. The Raja (King) held audience here to hear and receive petitions from the public as suggested by name. In third courtyard, the private quarters of the Maharaja, his family and attendants were located. The entrance to this courtyard is through the Ganesh Pol or Ganesh Gate, which is embellished with mosaics and sculptures. This courtyard have two opposite buildings, separated by a garden built in the fashion of the Mughal Gardens. The building on the left of the entrance gate is called the Jai Mandir. It is decorated with glass inlaid panels and multi-mirrored ceilings. The mirrors used here are of convex shape, decorated with colored foil and paint. It glitters bright under candlelight at the time it was in use. Another name given to Jai Mandir is Sheesh Mahal (mirror palace). Sheesh mahal was built by king Man Singh in 16th century and completed in 1727, the foundation year of Jaipur state. Jas Mandir is on the top of Jai Mandir which is a hall for private audience with floral glass inlays and alabaster relief work. The other building opposite to the Jai Mandir is known as the Sukh Niwas or Sukh Mahal (Hall of Pleasure). This hall is approached through a sandalwood door. The walls of this hall are decorated with marble inlay work with niches called “chînî khâna”. A piped water supply flows through an open channel of this hall that runs through this edifice which is used to keep the environment cool, as in an air-conditioned environment. The water from this channel then flows into the garden. A particular attraction here is the “magic flower”. It is carved marble panel at the base of one of the pillars around the mirror palace depicting two hovering butterflies. The flower has seven unique designs including a fish tail, lotus, hooded cobra, elephant trunk, lion tail, cob of corn, and scorpion. Each one of the design is visible by partially hiding the panel with the hands. The garden, located between the Jai Mandir on the east and the Sukh Niwas on the west, was built by Mirza Raja Jai Singh (1623–68). The garden is patterned likewise Chahar Bagh or Mughal Garden. It is in sunken bed which is shaped in a hexagonal design. It is laid out with narrow channels lined around a star-shaped pool with a fountain at the center. Water for the garden flows in cascades through channels from the Sukh Niwas and also from the cascade channels originating from the terrace of the Jai Mandir known as “chini khana niches”. In fourth courtyard, the Zenana (Royal family women, including concubines or mistresses) lived. This courtyard has many living rooms where the queens resided. The visitors visiting the palace also lives here with the permission of the king. The Palace of Man Singh I lies on the south of this courtyard, which is the oldest part of the palace fort. The palace was completed in 1599 taking 25 years to build during the reign of Raja Man Singh I (1589–1614). It is the main palace. The rooms on the ground and upper floors are decorated with frescoes and colored tiles. However, this pavilion was used by the maharanis (queens of the royal family) as their meeting place. All sides of this pavilion are connected to several other small rooms with open balconies. The exit from this palace will take you to the city of Amer. A tunnel is also build inside the Amer fort which will directly take you to the Jaigarh fort backside. So, This tunnel was used as the escape path for the kings and queens at the time of attack. However, the tunnel is approximate 1.5 km. long and consists of stairs. Above all secrets, this Amer fort tunnel is one of the best kept secret. The Amer fort tunnel was opened in 2012 for visitors and tourists. However, there are two ways to reach inside the main courtyard of Amer fort. One is through walking, another is through your personal vehicle. If you chose to enter from the front side of Amer fort, then you have to park your vehicle in the front of the fort and start climbing the fort. Elephant ride is also available for visitors to reach Amer fort. If you choose to drive through your personal vehicle, then you can take your vehicle to the top of the Amer fort from the backside of it and then take entry into the Amer fort. Elephant ride around the fort is a must to view fort, in the same vein of a king or queen. However, you ca also opt for four-wheel drive tour to and fro which includes one hour waiting time. Watching the illuminated fort from the bottom of the hill in the evening. Visit museum and garden inside the fort. Panoramic view of whole city from Char garden. In Evening, Classical dance program is arranged in Sukh Mahal. Tickets will be available in the ticket counter. Enjoying puppet shows and traditional songs which are available during dinner time. Turban museum is free to enter in the fort where you can find a large collection of turbans. Apart from Siladevi temple, you can find lots of temples in the palace along with old havelies. Entry Ticket for Indian visitors: INR 100. Ticket for Indian students: INR 10 (With college or school ID card). Entry Ticket for Foreign Visitors: INR 500. Ticket for Foreign Students: INR 100 (With college or school ID card). Light Show in English: INR 200 per person. Light Show in Hindi: INR 100 per person. Elephant Ride: INR 1100 Single or per couple. Four wheel drive around fort: INR 300. However, the fort is opened for visit from 9 am in the morning till 6 pm in the evening. But, Elephant rides are available from morning 9:30 am till afternoon 1:00 pm. However, the light show in Hindi starts from 8 pm in the evening and the English light show starts from 7:30 pm in the evening. All the time is according to ISD. You need a minimum of 3 hrs to visit this beautiful fort and enjoy the beauty. However, the best time to visit this fort is during monsoon season. A kund is also near amer fort known as Panna meena ka kund. This kund was constructed during sixteenth century. It is situated near Anokhi Museum at Jaipur-Amer road. This place was mainly utilized as a place of social meetings. Popularly known as Step well. It is also known as Panna Mian ki Baoli and Panna Miyan ka Kund. The symmetrical step walls are main attraction at this place. Pieces of Octagonal shaped are used in the core of the Kund and terrace on two floors. However, the stairs are in zigzag geometrical pattern which leave the visitors charmed.